Asus T100TAF-B1-MS is a very affordable sleek 10.1 inch tablet and laptop in one as part of the ‘Transformer Book’ series. So you’ll find that it is quite similar to the other transformer books with a quad core Intel Atom processor, smaller amounts of memory and eMMC storage and a high definition display with IPS feature. 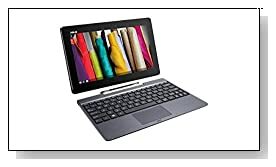 You have the option to use it with keyboard attached so you can work or do your things just like on a laptop (you get a free 12 month subscription to Microsoft Office 365 Personal) or remove the touch display and you’ll get a tablet with Windows 8.1 operating system that supports multiple gestures. Battery life is claimed to be up to 11 hours by the manufacturer and shouldn’t be less than 8-9 hours in practice. Asus T100TA includes the quad core Intel Atom Z3735F at 1.33 - 1.83 GHz speeds with Burst Technology but no hyper threading (it is already 4 cores), 2 GB DDR3L-RS memory at 1333 MHz, 32GB eMMC hard drive (smallest storage in T100 series but you can always expand it through the microSD card slot) and 32-bit Windows 8.1 with Bing search- Signature edition meaning no third party bloatware or junkware that will annoy you or that you need to get rid of and a free anti-virus software is pre-installed. Intel Atom Z3735F Bay Trail is adequate for daily tasks like internet and Office- work and play including some light gaming and is faster than many other Android systems- works great as a tablet. 10.1 inch high definition LED-backlit display with 10-finger multi-touch support that works well and 1366 x 768 pixel max screen resolution offers OK picture quality not being Full HD- so will not be as sharp but colours are vivid enough and it has an IPS panel rather than TN, so you have wider viewing angles which come in especially handy in a 2-in-1 PC. Graphics card is the integrated Intel HD (Bay Trail) with shared memory with the main processor and with performance levels similar to Tegra 4 graphics processor, will let you stream multimedia, edit photos and play the most demanding Android titles with no problems and the less demanding older Windows games like World of Warcraft fluently at lower settings and resolutions but almost none of the newest titles. Sound quality should be OK through the integrated audio and speakers and the frontal webcam is a 1.2MP one with built-in microphone- good for casual Skype chats. You have the HDMI port if you want to do your thing- watch movies etc. on your large screen HDTV in HD quality. Gray Asus Transformer feels durable and well-made (kind of dense) like the rest of the line, weighs 2.47 pounds (1.31 lbs as a tablet) and has the dimensions of 10.80 x 6.70 x 0.80 inches- lightweight and compact enough to be taken anywhere. The non-backlit keyboard with chiclet style keys with 1.4mm key travel and a small touchpad with 76 x 42 mm dimensions but not a separate 10-key numeric pad, is detachable to turn the unit into a very smooth functioning tablet with IPS panel display. Battery life is up to 11 hours from its 2-cell 32WHr battery but a couple of customers commented on it as being more like up to 8 to 9 hours in normal use. There is no optical drive and no USB 3.0 port but a micro USB 2.0 port on detachable keyboard, a micro HDMI video output, 802.11a/b/g/n (Miracast enabled) wireless, Bluetooth 4.0, 3-in-1 Media Card Reader (MicroSD/MicroSDHC/MicroSDXC) and a Headphone output / Microphone input combo. Conclusion: Asus T100TAF-B1-MS Signature Edition appears to be a nice new addition to budget transformer book range but with a smaller storage space which can be expanded through the microSD card slot, offers adequate overall performance for web surfing, video streaming, word processing or preparing school assignments and is offered with a 1 year free Microsoft Office 365 and being a signature edition PC you will get a free anti-virus installed and no unnecessary junk software to be a burden on already limited memory and hard drive. We like the long battery life, portability with compact size- slim and lightweight and the IPS panel on the regular resolution HD touch display. The quad core Intel Atom Z3735F is also much faster than the previous generation Intel Atom’s but still would not be enough for very demanding software or new generation games. Windows 8.1 can be a problem for some despite the well functioning touch display but you will soon be able to replace it with the newer Windows 10. Touchpad is a little small due to the small size of the machine but it shouldn’t be a problem as it has a nice touch display for both laptop and tablet modes. Considering the price level, this Transformer Book is a great alternative to Chromebook’s, if you want a Windows laptop that turns into a tablet conveniently.